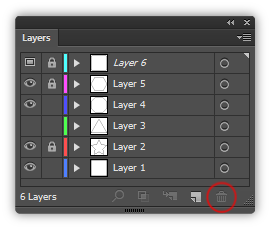 In Illustrator, how do I move all vectors in 1 layer to top-most layer-tier and discard the sublayer containers and retain the original layer name? 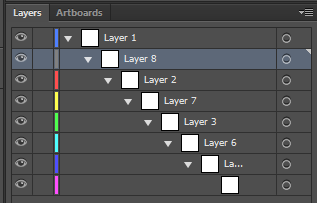 Basically, bring all sublayers and contents to the top in 1 layer. As far as I'm aware there's no one solution which works for everything all the time. Copy/Paste to a new layer is a good solution. There are also some little used Layer Panel menu items that may help. Note that no artwork is selected in this animation. It's all merely moving layers and layer structure. Three layers, with nested sublayers on a couple of the layers. Highlight top layers and choose Flatten Artwork from the Layer Panel Menu -- This moves all layers, sublayers, and objects to one single layer. This is not like Photoshop's "Flatten" command. This ONLY refers to the layer structure in the panel and has nothing to do with actual artwork. Highlight sublayers and choose Merge Selected from the Layer Panel Menu -- this moves all sublayers to one sublayer. Highlight and Manually move objects out of that last sublayer. How useful this is depends a great deal upon the current structure of any layers. Depending upon how deep nested sublayers go, or how prolific they may be, it may take using the commands a few times on different sets of highlighted layers/sublayers. Although I have all the layers/sublayers expanded for the animation, these commands work on collapsed layers. So, you don't have to expand layers, just highlight them and and choose the menu items. Unlock all layers you want to move from. Now select extra layers and drag them to the trashcan. Not the answer you're looking for? Browse other questions tagged adobe-illustrator vector layers or ask your own question. Why is Illustrator not making sublayers for each new path? Photoshop: How to duplicate layer and move it into other specific group? How to select parent layer (and all child layers) with mouse, selecting one of its child?